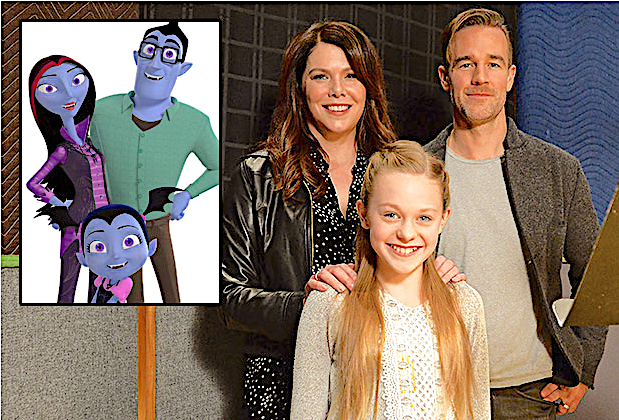 Vampirina stars Lauren Graham, Isabella Crovetti and James Van der Beek. DVD Review: Vampirina: Ghoul Girls Rock! In the sixties, kids loved The Munsters, a lovable TV family of ghouls (a Frankenstein monsters, a couple of vampires, a little boy wolf, etc.) that coped with life in the suburbs, as well as the classic series Bewitched. In the seventies, there were the Saturday morning cartoon versions of Sabrina the Teen-Age Witch and the Groovie Goolies. In the eighties, Sabrina became a live-action sitcom (today she’s back but in a series that is not for children). 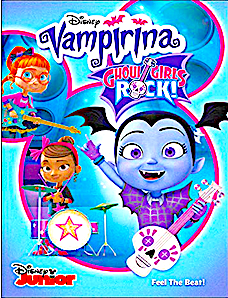 Vampirina took a fresh approach, first in children’s books, then in this Disney Junior CD animated adaptation, adding a gentle rock ‘n roll and girl power approach. Nicknamed “Vee” (voiced by Isabella Crovetti of the short-lived and much-missed ABC series The Neighbors) who moved with her loving vampire parents (voices of Lauren Graham and James Van Der Beek) from Transylvania to Pennsylvania, in a tony townhouse bed and breakfast. Her most constant companions are a goofy ghost (Mitchell Whitfield) and a wisecracking ghost (patent pending by Wanda Sykes). Vee also has two human best friends, Poppy and Bridget. The stories alternate between Vampirina dealing with real world situations and Vee drawing her pals into her world situations. It’s done in very bright and cheery style, after all being part of Disney Junior, and offers up peppy tunes in almost every episode. The Vampirina Ghoul Girls Rock! DVD includes ten eleven-minute stories and one extended episodes called “Home Scream Home,” obviously created as something extra-special. Vee, her parents and friends travel back to Transylvania for a talent contest and, while it’s the usual “mean pop group vs. nice pop group” to those of us who have seen this sort of story before, kids will love it. It’s also done at a higher budget than the other episode by nature of the sheer number of characters that were necessary. Maybe it’s not a new story, but it has its charm. As extras, there are eight “music videos” from Vampirina’s album, which also served as Disney Junior TV interstitials (short features to play between shows). Vampire Weekend / The Bird Who Knew Too Much / The Ghoul Girls / Game Night / Oldie But a Ghouldie / Beast in Show / Vampirina Ballerina / Treasure Hunters / Countess Vee / Frights, Camera, Action! • There is a Home Scream Home read-along book and compact disc set with soundtrack dialogue from the episode and the song, “Ghoul Girls Rock!” and another read-along called Vee’s Slumber Party. • Vampirina is also featured on the Disney Junior Music albums Dance Party!, Disney Junior Holiday Hits and the new Holiday Hits, Volume 2, all available for download on amazon.